The story of how India acquired nuclear weapons gets almost no attention in the Western media as they continue to focus on nuclear proliferation by Pakistan's AQ Khan. The nuclear proliferation narrative in the mainstream American and European media begins with A.Q. Khan's network rather than the actors in North America and Europe as the original proliferators of nuclear weapons equipment, materials and technology to India in 1960s and 1970s. These nuclear exports from US to India continued for several years even after the Indian nuclear test in 1974. The real story, as recounted by Paul Leventhal of The Nuclear Control Institute, begins with the US and Canada supplying nuclear reactors and fuel to India in 1960s. As the story unfolds, we learn that the spent fuel from Canadian Cirus reactor was reprocessed into bomb-grade plutonium using a reprocessing plant provided by an American-European consortium, and later used to explode India's first atom bomb at Pokhran in 1974. This is the key event in South Asia that led to Pakistan's pursuit of nuclear weapons culminating in nuclear tests by both India and Pakistan in 1998. CIRUS (Canadian reactor supplied to India) holds a very special place in nonproliferation history and the development of US nonproliferation policy. This needs to be understood if we are to do the right thing in working out a new nuclear relationship with India. My own personal involvement in this history and policy began with a telephone call I received 31 years ago on a May morning in 1974 when I was a young staffer on the U.S. Senate Government Operations Committee. It was from a Congressional liaison officer of the U.S. Atomic Energy Commission who said he was calling to inform me that India had just conducted a nuclear test and to assure me that "the United States had absolutely nothing to do with it." At that time, I was working on legislation to reorganize the AEC into separate regulatory and promotional agencies. I had begun investigating the weapons potential of nuclear materials being used in the U.S. Atoms for Peace program, both at home and abroad. The official wanted me to know there was no need to consider remedial legislation on nuclear exports because the plutonium used in India's test came not from the safeguarded nuclear power plant at Tarapur, supplied by the United States, but from the unsafeguarded Cirus research reactor near Bombay, supplied by Canada. "This is a Canadian problem, not ours," he said. It took me two years to discover that the information provided me that day was false. The United States, in fact, had supplied the essential heavy-water component that made the Cirus reactor operable, but decided to cover up the American supplier role and let Canada "take the fall" for the Indian test. Canada promptly cut off nuclear exports to India, but the United States did not. In 1976, when the Senate committee uncovered the U.S. heavy-water export to India and confronted the State Department on it, the government's response was another falsehood: the heavy water supplied by the U.S., it said, had leaked from the reactor at a rate of 10% a year, and had totally depleted over 10 years by the time India produced the plutonium for its test. But the committee learned from Canada that the actual heavy-water loss rate at Cirus was less than 1% a year, and we learned from junior-high-school arithmetic that even a 10%- a-year loss rate doesn't equal 100% after 10 years. Actually, more than 90% of the original U.S. heavy water was still in the Cirus reactor after 10 years, even if it took India a decade to produce the test plutonium---itself a highly fanciful notion. We also learned that the reprocessing plant where India had extracted the plutonium from Cirus spent fuel, described as "indigenous" in official U.S. and Indian documents, in fact had been supplied by an elaborate and secret consortium of U.S. and European companies. Faced with this blatant example of the Executive Branch taking Congress for the fool, the Senate committee drafted and Congress eventually enacted the Nuclear Non-Proliferation Act of 1978. And the rest, as they say, is history. Paul Leventhal's story about India's diversion of civilian nuclear programs to build weapons is corroborated by other sources such as the Bulletin of Atomic Scientists and the Wisconsin Project. Unfortunately, not much has changed in Washington since 1974 as the duplicitous US policy of "non-proliferation" continues to this day. Washington never talks about the Israeli nuclear weapons and the US administration continues to raise objections to the Chinese sale of nuclear power plants to Pakistan which is suffering from crippling energy deficits. 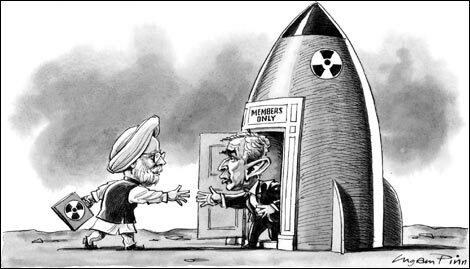 Meanwhile, the 2009 US-India nuclear deal legitimizes India as a nuclear weapons state and encourages continuing Indian buildup of its nuclear arsenal even as the US targets Iran for its alleged efforts to build nuclear weapons. The question Mr.Haq is whether india has ever proliferated to other countries..as opposed to pakistan's brilliant track record of government sponsored proliferation to libya, north korea and iran, india had turned down libya's request for nuclear co-operation..
And point to be noted, it was because of such a clean non proliferation record that india was offered the nuclear pact that pakistan seeks and is continually been denied..
Gourish: "And point to be noted, it was because of such a clean non proliferation record that india was offered the nuclear pact that pakistan seeks and is continually been denied.."
India is a major prolifertor, according to India watcher Stephen Cohen of Brookings. "We define nonproliferation in different ways -- the Indians point to their great record of not transferring nuclear technologies and also, of course, point to Pakistan and China. For many Americans, the fact that India went nuclear is a nonproliferation disaster. I don't share that passion, but clearly it did some damage to the nonproliferation regime. Whether it is justified or not is another question, but India cannot simply say they are great on nonproliferation because in fact they were a major proliferator." The fact is that there would be no nuclear weapons program in Pakistan if India had not diverted from US and Canada supplied plants and materials to build and explode its first A-bomb in 1974. This is what Mitt Romney had to say a few days ago. "WASHINGTON — Pakistan took a lot of criticism in Saturday's Republican U.S. presidential debate, with a leading candidate saying it was nearly a failed state and another suggesting the United States cut its foreign aid to zero. But it is unclear whether any of their ideas is likely to be imposed on a country that has nuclear weapons and whose cooperation is seen as vital to stabilizing Afghanistan as the United States prepares to pull out from there by the end of 2014. Former Massachusetts Gov. Mitt Romney said Pakistan has multiple centers of power, including the relatively weak civilian leadership, the military and the powerful intelligence agency know as the Inter-Services Intelligence Directorate. "The right way to deal with Pakistan is to recognize that Pakistan is not a country, like other countries, with a strong political center that you can go to and say, 'Gee, can we come here, will you take care of this problem?"' Romney said. "This is instead a nation which is close to being a failed state. I hope it doesn't reach that point, but it's really a fragile nation," he said. Riaz, I am sure that doesn't sit too well with you! Poonam: "This is what Mitt Romney had to say a few days ago"
Both US and American policymakers and politicians agree that US-Pakistan alliance is like a bad marriage where divorce is not an option. Many Americans are frustrated because Pakistan is refusing to do America's bidding. "I would reduce foreign aid to many, many countries, but there's a problem because Pakistan has a nuclear weapon," Bachmann said. Riaz, you are confusing nonproliferation and proliferation. Of course since India has not signed the NPT it is not a nonproliferation country meaning if India chooses it will make and use nuclear weapons. However, it is not a proliferator meaning it will not sell nuclear technology to any other country. Pakistan on the other hand in not a nonproliferation country AND a proliferator having sold the technology to other countries. Nuclear proliferation is a term now used to describe the spread of nuclear weapons, fissile material, and weapons-applicable nuclear technology. By that definition Pakistan worldwide is among the least trusted because of it's reckless record of selling nuclear technology for the purpose of making nuclear weapons. India certainly didn't cause Pakistan to sell technology to others! Suraj: "Riaz, you are confusing nonproliferation and proliferation." I'm afraid it's you who's confused. 1. Anyone who gives or receives nuclear technology in violation of international treaties and laws is a proliferator. By this definition, both US and India are proliferators. 2. Like Israel and India, Pakistan is not a signatory to the NPT. Do you think it’s a good agreement? No. I think it’s flawed for a number of reasons. I have colleagues and friends in the non-proliferation community who think any such agreement with India would be a disaster. I think India’s economic development and overall development is so important from a world historical point of view that we should do a lot to facilitate it. My problem is this particular agreement is first of all, the administration failed to establish criteria under which countries which haven’t signed the Non-Proliferation Treaty could come in to a broader non-proliferation set of rules and not be outside of this system. The three countries that haven’t signed the NPT are India, Israel, and Pakistan. What we should have done in my view is say “Here are criteria for each of those that if each of those countries met, they could get some form of increased nuclear cooperation with us.” Instead of offering criteria like that, the administration is just going to change the rules for India. There aren’t even really criteria here. The United States is just saying “They’re our buddies, they’re our friends. Let’s change the rules.” And it leaves Pakistan and Israel still out in no-man’s land. Why is that important? If you add criteria, such as a country is a democracy, it doesn’t support terrorist organizations, it has tight nuclear export controls, India would meet them and Pakistan wouldn’t meet them today, but it would give Pakistan an incentive to change behavior because it could then qualify and the same with Israel. But by treating India as an exception, it just reflects the Bush administration’s general disdain for a rule-based international system. It’s typical of this overall policy of “We’re going to do what we want and the heck with what others think and we’ll basically use our power to change rules when we think they need to be changed.” There are other problems with it too. The main one is that the administration didn’t really seek and didn’t get any agreement by India to limit its production of nuclear weapons, so at this point in world history I think we’re at a point where we ought to be able to say “No country is building additional nuclear weapons, no country needs additional nuclear weapons.” We should be able to say that we understand that India and Pakistan have theirs but at least let’s stop producing more of those things. We didn’t get it and we didn’t seek it because some in the administration actually want India to build more nuclear weapons as a counter to China. I think that’s a mistake. We can play a very long game using semantics. Regardless of whether India qualifies as a proliferator, the facts of the case are quite simple. India, as per the facts that you present, appears to have profited from US aid, in terms of N-tech. But since going nuclear, India has behaved responsibly. Pak profited, just like india, employing questionable methods to acquire technology. Then, just as the terror exports, Pak put up an item for sale that again threatens the global security balance. As for the differential treatment meted out to India - you can question it, or even detest the discrepancy – but it’s only a logical fallout of superior power politics. India’s muscle – economic and military and relative superiority will continue to help the country reap rich realpolitik gains in the BIG game. CANBERRA, Australia — Prime Minister Julia Gillard on Tuesday called on her ruling party to overturn its ban on Australia exporting uranium to India for peaceful purposes, describing the prohibition as “all pain with no gain” for the national economy. The center-left Labor Party government came to power in 2007 and immediately ended Australia’s negotiations with India on starting nuclear trade because India has not signed the Nuclear Nonproliferation Treaty. Gillard said she wants Labor to change its policy at its annual national conference next month because the United States lifted a “de facto international ban” on nuclear cooperation with India in 2005 by signing a bilateral deal with New Delhi to trade uranium and work together on civil atomic power generation. “Given that change in diplomatic circumstances around the world, for us to refuse to budge is all pain and no gain, and I believe our national platform should recognize that reality,” Gillard told reporters. But a policy change would not lead to uranium sales to India’s nuclear rival Pakistan or Middle Eastern nuclear power Israel. “When you look at other nations ... whether it be Pakistan or Israel, they are not in the same class,” she said. “We attach importance to our relations with Australia, which are growing across the board. Energy is one of the key areas of bilateral cooperation,” Indian External Affairs Minister S. M. Krishna said. “We understand that Prime Minister Gillard proposes to seek a change in the Australian Labor Party’s policy on sale of uranium to India, in recognition of our growing energy needs, our impeccable nonproliferation record and the strategic partnership between our two countries. We welcome this initiative,” he said. India will get all the uranium it ever wants from Canada,Russia etc. They are welcomed to make some money of our economic boom. As with the above the reactors in which Aussie uranium will be used will be under IAEA saeguards. As it is India has enough plutonium stockpiled for 4000(no typo) nukes it doesn't need aussie uranium for more. good move by a smart woman. Xun Wang, a former managing director of PPG Paints Trading Co. of Shanghai, admitted her guilt Tuesday before a federal judge in Washington. She also reached a $200,000 settlement with the Commerce Department and agreed to cooperate with investigators. PPG Paints Trading also pleaded guilty in December. The company and its parent, Pittsburgh-based PPG Industries Inc., paid nearly $4 million in fines and restitution. Wang, a Chinese citizen and lawful U.S. permanent resident, was accused of conspiring to send high-performance epoxy coatings to the Chashma II nuclear reactor run by the Pakistan Atomic Energy Commission. She admitted helping send three shipments of the coatings from the United States to Pakistan through a third-party distributor in China without the required license from the Commerce Department. Some U.S. experts say there is evidence Pakistan is building a plant near Chashma II to turn spent fuel from the reactor into weapons grade plutonium for the country's expanding nuclear arsenal. The criminal charge carries a penalty of up to five years in prison and a $250,000 fine. Her plea before U.S. District Judge Emmet Sullivan allows her to escape more serious charges she was facing that could have carried up to 65 years in prison. Wang, a 51-year-old from Hillsborough, Calif., was arrested at Atlanta's Hartsfield-Jackson airport this summer as she and her family were headed to Italy to celebrate her oldest daughter's graduation from prep school before starting Princeton. Her lawyers initially argued that charges against her were "technical," that she was at worst peripherally involved in the scheme and that the case involved paint, not any threat to American security or nuclear proliferation. Wang, who has a doctorate in physics from the University of California, Santa Cruz, and her husband ran their own paint import-export business. The couple, who have two daughters, sold it to PPG Industries in 2006 for more than $17 million, and the U.S. company hired her to run its wholly-owned Chinese subsidiary. A short time later, prosecutors say, the U.S. government rejected an application from PPG for a license to sell paint to an unnamed government-owned Chinese company, for use on the steel lining of the containment area of Chashma II. So PPG officials said the coatings were to be used at a nuclear power plant in China, where exports don't require a license from the Commerce Department. The report of the International Atomic Energy Agency (IAEA) published by a Washington think-tank on Tuesday repeated the sensational claim previously reported by news media all over the world that a former Soviet nuclear weapons scientist had helped Iran construct a detonation system that could be used for a nuclear weapon. In fact, Danilenko, a Ukrainian, has worked solely on nanodiamonds from the beginning of his research career and is considered one of the pioneers in the development of nanodiamond technology, as published scientific papers confirm. It now appears that the IAEA and David Albright, the director of the International Institute for Science and Security in Washington, who was the source of the news reports about Danilenko, never bothered to check the accuracy of the original claim by an unnamed "Member State" on which the IAEA based its assertion about his nuclear weapons background. The unnamed member state that informed the agency about Danilenko's alleged experience as a Soviet nuclear weapons scientist is almost certainly Israel, which has been the source of virtually all the purported intelligence on Iranian work on nuclear weapons over the past decade. duh! read clash of civilizations! India is an ally of westrn and orthodox(Russian) civilization and an enemy of chinese and islamic civ as is the west/Russia. Rules for long term friends(India) are very different from short term allies(Pakistan). .....It is the robustness of scientific research and innovation that sets apart great powers from the mediocre ones. We have good scientists, but why has India not produced outstanding scientists who make path-breaking discoveries that will make the world sit up and take notice? Should we continue to be satisfied with tweaking borrowed technologies? Is reverse engineering an innovative phenomenon? All debates about scientific research inevitably end up zeroing in on the deficiencies of our educational system as the root cause of the abysmal record in scientific research. This is only part of the story. A nation's culture — belief systems, values, attitudes — plays a significant role in determining the quality of scientific research. The Oriental attitudes differ from the Occidental values in many respects. Asian societies are basically collectivist, that is, the collective good of society ranks higher than individual happiness and achievements. People do not ask what they can do for their country; they are always asking what the country will do for them. They look up to the state for guidance, leadership and direction. There is no burning individual ambition to excel and achieve something new. In the West, individuals try to achieve their potential through their own efforts, aided and facilitated by enabling laws and institutions. Self-reliance is the key objective of life. An independent life requires a free and questioning mindset that takes nothing for granted and constantly challenges conventional wisdom. Children are encouraged to push the frontiers of knowledge by self-examination and open-minded enquiry. It is only a sceptical and dissenting mind that often thinks out of the box to explore new vistas of knowledge. Collectivism promotes conformism and deference to authority whether it is parents, elders, teachers or the government. It is heresy to question established values and customs. We pass on our passivity and uncritical attitudes to our children. No wonder, the educational system encourages rote learning and unquestioning acceptance of what is taught in the classrooms and stated in the textbooks. How can we expect our children to suddenly develop an enquiring and inquisitive attitude when they have been brought up in a milieu that discourages ‘disruptive' thoughts? India and China were once advanced nations before foreign rule drained their resources and sapped their willpower and scientific traditions. Cultures tend to become conservative and defensive when subjected to long spells of colonial exploitation. Indians are great believers in destiny. But our tradition does not frown upon free will and individual excellence. We must realise that our ability for free action remains unhampered despite what destiny may hold in store for us. Another flaw in our culture that prevents individual excellence is the fear of failure. The stigma associated with failure makes our children risk-averse while choosing their courses and careers. Scientific research is a long-drawn war on received wisdom that requires many battles before it can be won. Science was not built in a day. Some of the battles can end in defeat. In the West, they celebrate failure as a stepping stone to success. UN Secretary General Ban Ki-moon warned Tuesday that the UN Conference on Disarmament could fail because of a three-year stalemate over Pakistan’s reluctance to discuss nuclear power. “Today, this distinguished body is no longer living up to expectations,” Ban said at the first of three public sessions scheduled this year, in a speech read out by the top UN official in Geneva, Kassym-Jomart Tokayev. “The future of the conference is in the hands of member states,” Ban said, urging the immediate start of nuclear negotiations. Citing national security, Pakistan has since May 2009 balked at implementing a work programme established by the UN conference, blocking the resumption of nuclear talks. Taking advantage of a new climate established by U.S. President Barack Obama, the conference emerged in May 2009 from 12 years of obscurity, adopting for the first time since 1996 a programme of negotiations on fissile materials and weapons. Since then the reluctance of Pakistan to accept a possible treaty banning the production of fissile material for nuclear weapons has prevented the conference moving forward. In recent years authorities in Islamabad said they did not wish to enter into negotiations on a treaty which they say endorses an “asymmetry” of nuclear power between Pakistan and its arch-rival India. The council ends its first session of this year on March 30. Estimated to have 80-100 nuclear warheads, India is modernising its nuclear arsenal to increase the diversity, range, and sophistication of its delivery vehicles, a report said Tuesday,At the same time, it estimates that Pakistan has more nuclear weapons than India, saying Islamabad is rapidly developing and expanding its atomic arsenal at a cost of $2.5 billion a year. The report “Assuring Destruction Forever: Nuclear Modernisation around the World” said India is developing a range of delivery vehicles, including land- and sea-based missiles, bombers, and submarines.“There are no official estimates of the size of India’s stockpile of fissile materials, though it is known that India produces both HEU (highly enriched uranium) for its nuclear submarines and plutonium for weapons,” said the 150-page report by ‘Reaching Critical Will of the Women’s International League for Peace and Freedom.’The part of the report dealing with India was contributed by Professor MV Ramana, a physicist who works at the Nuclear Futures Laboratory and the Programme on Science and Global Security, both at Princeton University, a physicist who works at the Nuclear Futures Laboratory and the Programme on Science and Global Security at Princeton University. “There has been speculation that India has used reactor-grade plutonium in its nuclear weapons, in which case, the nuclear arsenal could potentially be much larger, as India has approximate 3.8 to 4.6 tons of separated plutonium from its power reactors. Its fast breeder reactor programme also provides another potential source of producing weapon-grade plutonium”Based on its Dec. 2011 recent missile tests, the report said, “It appears that India is aiming to have all legs of its nuclear triad operational by 2013. There are also plans to expand the nuclear weapons and missile production complex as well as the capacity to enrich uranium. “The expansion of India’s nuclear and missile arsenals are part of a larger military build-up and consistently increasing military spending. It is estimated that Pakistan could have a stockpile of 2750 kg of weapon - grade HEU and may be producing about 150 kg of HEU per year,” it said.Estimates suggest Pakistan has produced a total of about 140 kg of plutonium, the report said. German Nobel literature laureate Günter Grass labelled Israel a threat to "already fragile world peace" in a poem published on Wednesday that drew sharp rebukes at home and from Israel. In the poem, titled What Must be Said, published in German daily Sueddeutsche Zeitung and Italy's La Repubblica among others, Grass criticises what he describes as western hypocrisy over Israel's own suspected nuclear programme amid speculation it might engage in military action against Iran to stop it building an atomic bomb. The 84-year-old Grass said he had been prompted to put pen to paper by Berlin's recent decision to sell Israel a submarine able to "send all-destroying warheads where the existence of a single nuclear bomb is unproven". "The nuclear power Israel is endangering the already fragile world peace," he wrote. His poem specifically criticises Israel's "claim to the right of a first strike" against Iran. Grass also called for "unhindered and permanent control of Israel's nuclear capability and Iran's atomic facilities through an international body". Grass did not mention calls for the destruction of Israel that have been made by President Mahmoud Ahmadinejad, but obliquely referred to the Iranian people being "subjugated by a loudmouth". Israel is widely believed to have an arsenal of nuclear weapons but has never admitted it, pursuing instead an official policy of "ambiguity" to deter potential attackers. Israel has three Dolphin submarines from Germany – one half-funded and two entirely funded by Berlin – two more are under construction, and the contract for a sixth submarine was signed last month. Dolphin-class submarines can carry nuclear-tipped missiles, but there is no evidence Israel has armed them with such weapons. Iran insists it only seeks nuclear power for energy and medical research. Grass said he long kept silent on Israel's own nuclear programme because his country committed "crimes that are without comparison", but he has come to see that silence as a "burdensome lie and a coercion" whose disregard carries a punishment – "the verdict 'antisemitism' is commonly used". The left-leaning Grass established himself as a leading literary figure with The Tin Drum, published in 1959, and won the Nobel Prize in 1999. He urged fellow Germans to confront their painful Nazi history in the decades after the second world war. "Iran is the threat for world peace – and Israel the only democracy in the entire region, and at the same time the world's only whose right to exist is openly questioned," said Charlotte Knobloch, a former leader of Germany's Jewish community. The German chancellor, Angela Merkel, is a staunch ally of Israel, and her spokesman reacted coolly to Grass's remarks. "There is artistic freedom in Germany, and there thankfully also is the freedom of the government not to have to comment on every artistic production," Steffen Seibert said. The head of the German parliament's foreign affairs committee – lawmaker Ruprecht Polenz, a member of Merkel's Christian Democrats – told the daily Mitteldeutsche Zeitung that Grass was a great author "but he always has difficulties when he speak about politics and mostly gets it wrong". "The country that worries us is Iran," he was quoted as saying, adding that "his poem distracts attention from that". Really enjoy this blog. Good to see that someone isn't fooled by all the hype - P.S. ignore all the negative comments - they're all from jealous Indian fools who have swallowed the hype - the US has dumped a few McDonalds and suddenly they think that they're some 'superpower' or something (guffaw, guffaw)! Funny how they label other countries 'failed states' when India itself was a failed state itself before liberalization. Guess you CAN fool some people ALL THE TIME!!! ^^RH: "US Proliferated Nukes to India"
Logically, this does not make sense. "Proliferation" in the legal definition of the term refers to the DELIBERATE transfer of Nuclear weapons technology for either (a) geopolitical reasons or (b) cash. (I) US proliferated to UK and France. REASON: Geopolitical-- So that Western Europe (UK, FR) could ward-off a Soviet invasion on its own even if the US was unable to participate. (II) USSR proliferated to Red China. REASON: Geopolitical-- So that Beijing could independently counter MacArthur's "let's-nuke-them" threat against China during the Korean War. (III) Red China proliferated to Pakistan. REASON: Geopolitical-- So that balance of power could be maintained in South Asia without the USSR-India alliance defeating the China-Pakistan alliance. (IV) Pakistan proliferated to Libya, Iran and North Korea. REASON: CASH or Kind --- Dollars from Iran and Libya, and missiles from North-Korea. All of these proliferation activities pass the logic-test. But US proliferating to India during the India Socialist Era of Anti-American Third-World Activism DOES NOT MAKE SENSE. It does not pass the above-mentioned logical test. Now if you had said that the USSR proliferated to India after the Sino-Soviet Split; now that COULD have made some sense…. HWJ: "But US proliferating to India during the India Socialist Era of Anti-American Third-World Activism DOES NOT MAKE SENSE. It does not pass the above-mentioned logical test." Read the Leventhal article and Wisconsin Project reports. "So CIRUS holds a very special place in nonproliferation history and the development of US nonproliferation policy. This needs to be understood if we are to do the right thing in working out a new nuclear relationship with India. All of this nuclear proliferation happened after 1962. The US changed its stance toward India dramatically after the drubbing India got at the hands of Communist China in 1962. Lots of US aid poured into India and US applied sanctions against Pakistan during and after the 1965 war . ISLAMABAD — The Pakistan Navy has test-fired a new land attack missile in the North Arabian Sea off the coast of Pakistan this week. According to a Navy news release, the test included “firings of a variety of modern missiles including the maiden Land Attack Missile (LAM)” and the tests “demonstrated lethality, precision and efficacy” of the Navy’s weapon systems as well as the “high state of readiness and professionalism” of the Navy. A Navy spokesman confirmed “multiple platforms were engaged” in firing missiles. The firings took place on Dec. 19 and 21. Though the Navy has a variety of anti-ship and surface-to-air missiles, the Navy would not confirm the identity of the land-attack missile when asked. Mansoor Ahmed from Quaid-e-Azam University’s Department of Defence and Strategic Studies, who specializes in Pakistan’s national deterrent and delivery program, believes the missile is one of two varieties: either a land attack variant of the Chinese C-802/CSS-N-8 Saccade anti-ship missile in service with a variety of naval platforms; or a variant of the HATF-VII/Vengeance-VII Babur cruise missile. “Coupled with a miniaturized plutonium warhead, a naval version of the several hundred kilometer-range Babur [land attack cruise missile] or a 120-kilometer range C-802 missile can potentially provide Pakistan with a reliable if not an assured second strike capability and will complete the third leg of Pakistan’s eventual triad-based credible minimum deterrent — of which the naval leg was missing until now,” he said. A land-attack variant of the C-802 would be able to be fired from existing launchers aboard Pakistani ships. Ahmed however pointed out that M. Irfan Burney — chairman of the National Engineering and Scientific Commission (NESCOM), the research and development body that designed and manufactured the Babur cruise missile — witnessed the test firings. Ahmed believes that supports the notion that the missile was the Babur. Burney was joined by Chief of Naval Staff Adm. Muhammad Asif Sandila, onboard the F-22P class frigate Zulfiquar. The test comes seven months after Pakistan inaugurated the Naval Strategic Force Command. The Babur, once integrated with an operational naval command and control, “will help diversify the options available to counter India’s growing second strike capabilities at sea,” Ahmed said. “Pakistan’s response in this field was necessary in the face of an exponential increase in Indian strategic capabilities, such as ballistic-missile defenses and the induction of SSBNs [ballistic-missile submarines] and planned $40 billion worth of naval weapons platform acquisitions over the next decade,” he added. With an economy in chronically poor shape, the question of affordability and meeting the Navy’s expansion requirements in the face of a shortage of funds is a pressing concern. ^^RH: "The real story, as recounted by Paul Leventhal of The Nuclear Control Institute.."
QUOTE: "Some experts say the threat of the nuclear black market highlights the need to disarm countries like Pakistan of nuclear weapons entirely. "There has to be some hard thinking about how long Pakistan's nuclear program can be tolerated," Leventhal says. Zaid Hamid is right. The US is planning to attack us. They want to take away our nuclear weapons. The Nuclear Threat Initiative released a report on Wednesday ranking India's capacity for nuclear safety lower than neighbors China and Pakistan, The Hindu reported on Friday (The Hindu). The "2014 Nuclear Materials Security Index" lists India as 23 out of 25 countries with weapons-usable nuclear materials. The report cites India's amorphous regulatory environment -- which relies on guidance as opposed to requirements -- the lack of an independent regulatory agency, corruption in the enforcement of security measures, and an increased risk perception in the possibility of officials colluding in the theft of nuclear material as reasons for its low ranking. #Canada-#India 3000 ton uranium deal will spur nuclear proliferation, experts warn. #Pakistan #Iran http://www.cbc.ca/1.3036540 ... some nuclear proliferation experts say India has been able to make such a deal without abiding by the rules set out for most other countries that abide by the international non-proliferation regime. And they warn that countries the West has been attempting to bring into the rules-based system — such as Iran — will be less inclined to submit when they see the rules don't apply to India....Canadian technology used to gain bomb...India shocked the world when it conducted its first nuclear test in 1974. By then, the world had already grown used to the idea of an established club of nuclear nations, the same five that held permanent seats at the UN Security Council: the U.S., the Soviet Union, China, Britain and France....Israel and South Africa had already succeeded in developing nuclear weapons by working together, but neither country had tested them and their nuclear arsenals were still a well-kept secret....It was a bedrock principle of international security that no new nation should be allowed to join the nuclear weapons club....The Indian blast would set off an arms race on the subcontinent that culminated in a nuclear test by Pakistan in 1998. Today, the sub-continent is considered one of the most likely flashpoints for a future nuclear conflict. Pakistan on Thursday voiced concerns after certain individuals were reportedly arrested in India for their involvement in selling uranium, a highly radioactive material used in nuclear facilities. “Pakistan is deeply concerned about the reported incident involving the attempted sale of uranium in the black market,” Foreign Office spokesperson Dr Muhammad Faisal told reporters in Islamabad. “We are looking forward to the results of further investigations. The report raises several questions about nuclear security and or/interest of criminal groups and individuals in uranium and their motivations,” the spokesperson added. Pakistan’s reaction came just days after Indian authorities arrested five people from Kolkata who had come there to sell one kilogramme of uranium. Police in Kolkata have arrested five persons on Thursday night for allegedly carrying radioactive uranium worth Rs 3 crore. A team of detective department seized the highly radioactive substance from the men who had assembled at Mango Lane in central Kolkata. The arrested men - Javed Miandad, Sk Mughal Younus Biswas, Md Shahjahan Mondal and Basant Singh - were carrying a white plastic package with "uranium" printed on it. It also had batch number "14617071" mentioned on it. The package had a manufacturing date of 03.06.2017 and an expiry date 28.10.2024 mentioned. While Javed hails from Birbhum district, Mughal is a resident of East Midnapore, Shahjahan from North 24 Pargana and Yunus and Basant from Murshidabad district. Police have sent the consignment to Central Forensic Science Laboratory for analyses. Apart from the powdery substance, police have also seized fake state forest department appointment letters from the accused. All five have been sent to police custody for two weeks for questioning.